Pinetown Accommodation (Lions Lodge) is suitable for Corporate and Holiday Makers alike. Pinetown Accommodaion/Lion’s Lodge is situated in the quiet suburb of Farningham Ridge, Pinetown. Pinetown is a town 18kms West of Durban on the M13 Highway. Pinetown Accommodation (Lions Lodge) has very easy Freeway access to the N3 (to Johannesburg/Durban), the M7 (to Queensburgh) and the M13 (to Kloof/Hillcrest). Lions Lodge is suitable for corporate, business stay-overs and holiday makers alike. There is ample secure undercover and onsite parking. We boast 3 Double rooms, 2 Family and 1 Twin en-suite rooms; which all have their own entrance. Each room has a fridge and TV. There is a self catering kitchen with tea and coffee facilities. We also have 3 large Log Cabins with TV, shared ablutions and self catering kitchen area. There are numerous outstanding restaurants within a 10 km radius. We have a lovely thatched braai/barbeque area next to a sparkling blue swimming pool. 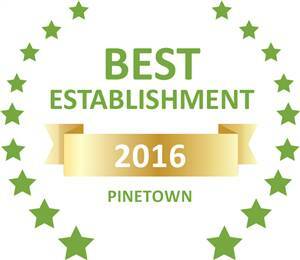 Based on reviews of establishments, Lions Lodge has been voted Best Establishment in Pinetown for 2016. 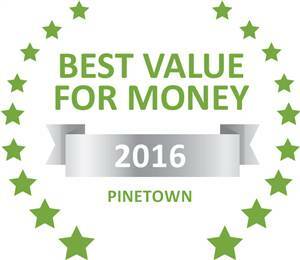 Based on reviews of establishments, Lions Lodge has been voted Best Value for Money in Pinetown for 2016. Based on reviews of establishments, Lions Lodge has been voted Best Establishment in Pinetown for 2017. 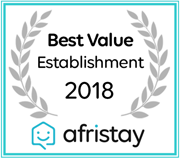 Based on reviews of establishments, Lions Lodge has been voted Best Value for Money in Pinetown for 2017. Major malls near Pinetown such as Pinecrest Mall has all major stores, just 4 km’s from the lodge. The Pavillion and Westville Mall are just 10 km’s away and has more than 250 stores and is well worth a visit for movies and restaurants. Kloof Village Mall, Hillcrest Corner Mall and Watercrest Mall right here in the Upper Highway area. Slightly further afield is the well known Gateway Theater Of Shopping Mall. We offer the following accommodation, see below and book your stay. Fridge and TV. WiFi available. Fridge and desk with tea and coffee supplied. Children under 12 half rate. Fridge with tea and coffee supplied. TV, each sleeps between 4/6 people on single bunks. I was travelling on my own and decided to stay at Lion's Lodge for four nights. I'm extremely happy to have found this place. Everything was good. The room was very clean and comfortable and more than met my needs. Nice and clean, very friendly people and helpful. Will definitely stop by again. Very nice. 5 stars. We stayed for 3 weeks when doing contract work in Umhlanga. The cabins, rooms were perfect for our needs. Great place to stop over. Rates very fair. Friendly host. Will stay again. Peaceful, neat and clean. Owners were very helpful and kind best place to be we enjoyed our stay there. Awesome place come experience. We enjoyed the pool in the summer heat! Looking for accommodation in Pinetown? *Please let us know your sleeping arrangements. i.e 2 people sharing, 2 people in separate rooms, etc. Thank you for choosing to stay with us at Pinetown Accommodation (Lion’s Lodge). Established by Neels and Mary Jooste, we offer a great place to stay over the night, a corporate stop-over, holiday makers made for you to feel at home.